Marguerite Michaels is an awesome supporter of the arts. I met her a few years ago at Marcia Derse’s Christmas sale. She told me she had recently bought one of my Confabulations photos at the Hudson Gallery. It was the one of two women on the sidewalk. At Marcia’s, she bought my abandoned church photo from my Still Standing series — maybe it reminded her of the time that she almost became a nun (she went through everything but the final vows.) Later, she bought my Woolworth’s photo and an artist book I made of my mother, Audrey Gentieu’s movie star pastel portraits. She took great pleasure in building her art collection, which went gangbusters during the “great recession.” She bought a ton of local art, and I for one really appreciate her for that. Marguerite is a strong and brilliant woman. After realizing that becoming a nun was not her calling, she moved to New York, where she worked for Time Magazine as a journalist, and eventually became the Bureau Chief in Nairobi. Living in Africa, Marguerite became well-versed in African Art and collected it. She came back to Toledo around 10 years ago, for the same reason that brings many of us back — to help family. 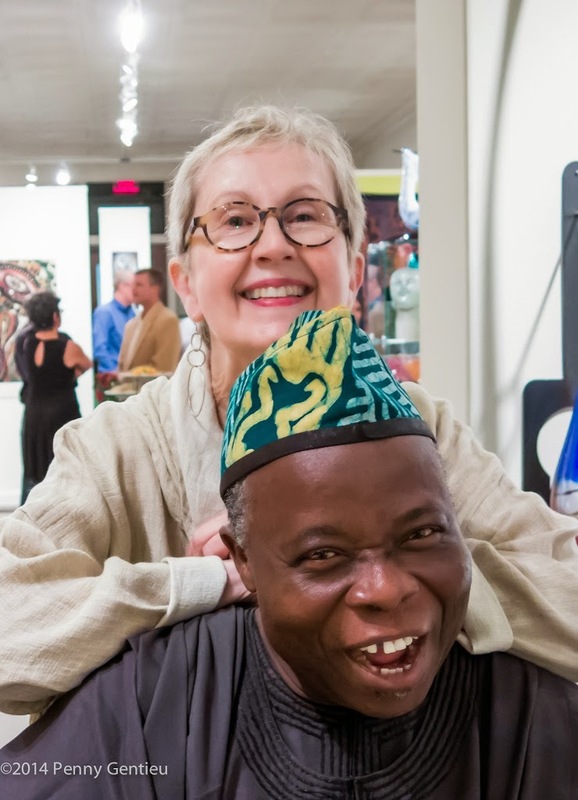 She immersed herself in collecting all kinds of art, and she brought contemporary African art to Toledo. In October 2013, Marguerite helped curate and sponsor an African Art exhibition at the Hudson Gallery. This photo above is Marguerite with artist Tunde Odunlade at the show. Marguerite is bold and courageous. For all the things she has done in her life, she has utilized her fullest heart and soul. She has now decided that, for whatever personal reasons, she did not need any of her collections in her life anymore and is selling everything. Just like that. No regrets, no emotion holding her back from her mission. Her latest chapter as a collector has abruptly come to an end. Her estate sale, which includes the entire contents of her house, is taking place every day this Easter week, culminating on Saturday. Her collection of Toledo artists is an eclectic snapshot of contemporary local art — work by Mr. Atomic, Willis Willis, Dave Wisnieski, Jan Dyer, Scott Hudson, Jay Bumbaugh, Lana Pendleton Hall, Richard Reed, Karl Mullens, Annie Crouter, Skot Horn, Paige Koosed, Bob Beach, Dominic Labino, Baker O’Brien, Ann Tubbs and yours truly. Previous PostPrevious Edith Franklin never lost her childhood playfulness.